WASHINGTON - Human nose is capable of discriminating at least 1 trillion different odors, a new U.S. study said Thursday. While humans can differentiate among several million different colors and almost half a million different tones, it has been said for decades that they are capable of discriminating between 10,000 different odors. "It's the generally accepted number," said study author Leslie Vosshall, professor at the Rockefeller University. "Our analysis shows that the human capacity for discriminating smells is much larger than anyone anticipated." The smells we encounter in real life are composed of complex mixes of odor molecules. 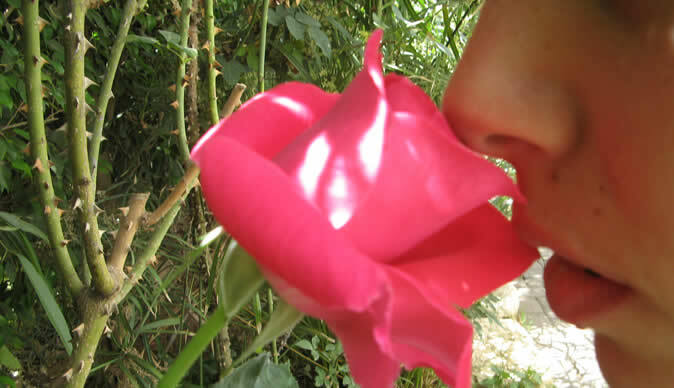 For example, the scent of a rose has 275 components, although only a small percentage of those dominate the perceived smell. In the new study, the researchers used 128 different odor molecules to create new composite scents. "We didn't want them to be explicitly recognizable, so most of our mixtures were pretty nasty and weird," Vosshall said. "We wanted people to pay attention to 'here's this really complex thing -- can I pick another complex thing as being different?'" The researchers presented 26 volunteers with three vials of scents at a time: two matched, and one different. Volunteers were asked to identify the one scent that was different from the others. Each volunteer made 264 such comparisons. Based on the results they obtained through these tests, the researchers made theoretical considerations and calculated that humans can discriminate at least 1 trillion olfactory stimuli. "I hope our paper will overturn this terrible reputation that humans have for not being good smellers," Vosshall said.